When you begin the search for where to live after leaving your home, it can be confusing. There are many options and differences between each community and understanding the differences can help you to make sure you’re making the right choice for your needs. Find the Right Level of Care: To truly find the right retirement facility, you need to be honest about the level of care you require. Whether that is independent living, assisted living, or nursing and rehab care, the more objective you are, the better your experience will be. Get Advice: When you know the level of care you need, consult other people you trust to get their opinions. See if anyone you know has recently gone through the same experience and gather their insight on what they’ve learned, what they liked, and what they wish they could do differently. Search Online: View the websites of each senior residence you’re considering to see what their online presence is like. You will often be able to get a good understanding of their style of care, experience, and view the resources they provide such as checklists, downsizing information, and financing guides. Visit in Person: Visiting the facility in person is a necessity. It allows you to see what the community looks like and take some notes during your time there. Make sure if you have any questions, you write them down before you go and take note of the answers. Visit it a few times and during different days so you can get a feel for how the staff are and the feeling overall. Schedule a Respite Stay: By scheduling a short-term stay in a facility you’re interested in, you can experience what that place has to offer before making a commitment. 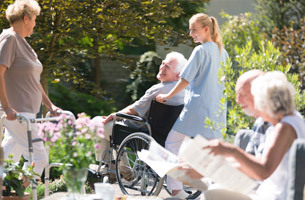 Those in respite care receive the same treatment as the long-term residents. A stay of at least two weeks is recommended to really get a feel for the space and what it can provide.